CinemaCon, the world's largest convention for theater owners, kicked off in Las Vegas last night, with the Sony Pictures panel including a surprise appearance by Once Upon a Time in Hollywood director Quentin Tarantino and star Leonardo DiCaprio. This upcoming movie, set in the year 1969, examining some of the most pivotal events from this year, hasn't even started filming yet, with principal photography slated to begin this summer. 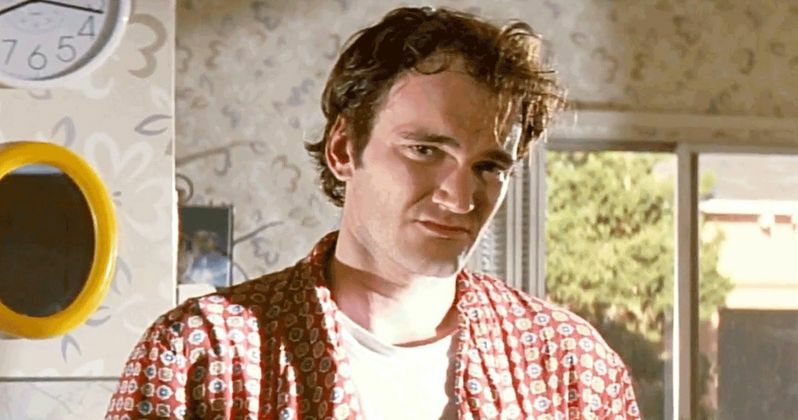 Without any actual footage to show, a sizzle reel of Tarantino's films was shown, with the director comparing this film to the 1994 seminal classic that put him on the map, Pulp Fiction. Here's what the director had to say below. "It takes place during the 1969 Hollywood era at the height of the counterculture explosion, at the time of the hippie revolution. During the summer, little by little, block by block, we'll be transforming Los Angeles in the psychedelic Hollywood of 1969." The sizzle reel confirmed the involvement of both Leonardo DiCaprio and Brad Pitt, but not of Margot Robbie, who has been widely reported to be playing Sharon Tate. The filmmaker wouldn't offer any specifics about the story, but he added that the interwoven storylines of this film are what make it so similar to Pulp Fiction. Here's what Tarantino had to say about this new movie, while making a bold comparison in regards to the teaming of Leonardo DiCaprio and Brad Pitt. "In 2019 at the end of the summer, August, as they are setting off the last explosion of the last franchise movie of the summer, Sony and myself will be coming to the theaters with the most exciting star dynamic-duo since Robert Redford and Paul Newman, Leonardo DiCaprio and Brad Pitt in Once Upon a Time in Hollywood." Tarantino's mention of Robert Redford and Paul Newman was in reference to their iconic pairing in Butch Cassidy and the Sundance Kid, which, not so coincidentally, was released in the year 1969. The movie is slated for release on August 9, 2019, which marks the exact 50th Anniversary of the grisly murder of actress Sharon Tate by members of the Manson Family. While it was originally rumored that the entire movie will be centered on this killing, it was later revealed that the movie's scope is far greater. The movie will center on Rick Dalton (Leonardo DiCaprio), the former star of a longtime hit Western TV series, and his stunt double, Cliff Booth (Brad Pitt), who are both struggling in Hollywood, and Rick's next-door neighbor is none other than Sharon Tate. Tarantino added that it's very difficult to talk about a movie that they haven't made yet, but he's excited to work with these stars again. While this movie will mark the first time that Pitt and DiCaprio have worked in the same movie together, Pitt starred in Tarantino's Inglourious Basterds and DiCaprio starred in the filmmaker's Django Unchained. Deadline also reports that Tarantino reminded the crowd that he is an exhibitor himself, since he owns the New Beverly Theater in Los Angeles, praising them for their work in keeping, "the theatrical experience outside the living room where it belongs with audience reactions."